I first met Dave Cockrum in 1972. I was selling model kits at some comic book convention in Manhattan, and my friend Mark Hanerfeld brought Dave to my table and introduced us. Dave and I clicked right at the start. He was only about 6½ months older than I, and we shared a seemingly endless number of interests - comic books, model building, '50s science fiction movies, military aviation (especially the early jets), Warner Brother cartoons, Godzilla movies, etc., etc. To me, it was as if I had discovered a brother I never knew I had! I was working at Aurora in those days, supervising the development of new model kits. It was a no-brainer to hire Dave to design new dinosaur and monster kits for the company. As a fan, he knew all the details and had tons of reference. As a modeler, he knew what other builders would be looking for. As an artist, he dynamically posed the figures in ways never before seen in styrene. 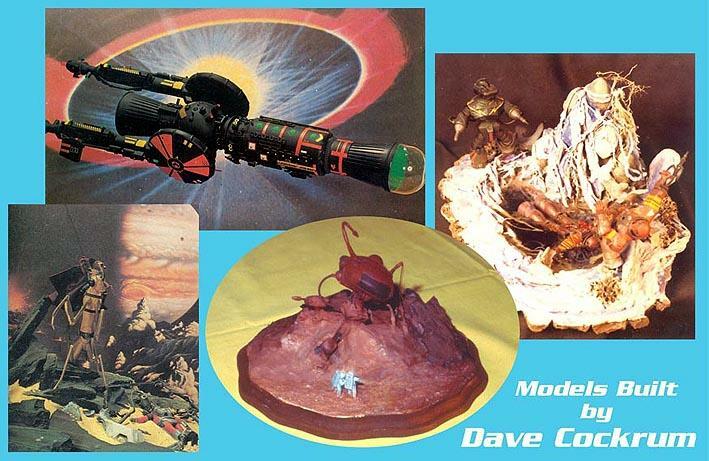 Many of Dave's designs added to Aurora's legendary status as the leading make of plastic model figure kits. Among them were the huge 1/12 scale Tyrannosaurus Rex, the Frankenstein Monster, Rodan and Ghidrah from Japan and, of course, the Creature from the Black Lagoon. Unfortunately, too many of the new kits Dave designed never got produced. Gort, the Metaluna Mutant, the comic strip Phantom, the Phantom of the Opera, the Mummy, King Kong, Godzilla, and a Stegosaurus were some of a painfully long list of cancelled projects - killed by a management that that decided to invest more money into new toys and games and reduce model kits to reissues. Ah, but the Cockrum magic couldn't be swept aside and forgotten. 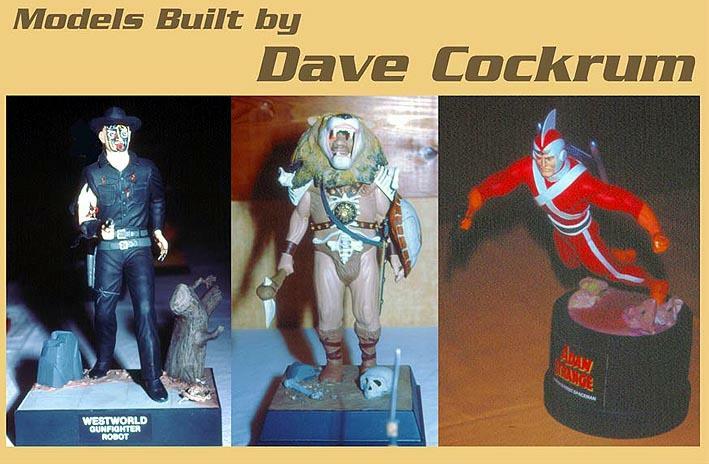 Years after Aurora went out of business, many of Dave's unused designs were resculpted and produced as limited run resin kits by people who loved what Aurora had once been and what Dave had done to perpetuate that glory. 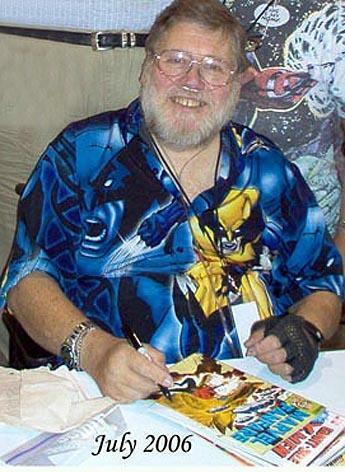 The fact that Dave went on to be a major force in the revival of The X-Men is common knowledge and has been reported many, many times. There's little that I can add to all that, except to say how thankful I am that Dave allowed me to be a small part of X-Men history. After leaving Aurora, I wound up at Marvel Comics as Coloring Coordinator. Dave was unhappy with the coloring he was getting on his X-Men, and he asked me to color the book. (I think he was sure that I would get the airplanes right!) I did so, and over the years I established the color schemes for several of his characters. Despite working on comic books together at Marvel, Dave and I were probably still more connected by modeling. We were both member of the Brooklyn Plastic Modelers' Society (BPMS), as was Dave's wife, Paty! Dave and Paty spent hours driving to the meetings each month, and Dave usually had some new model to display. I edited the club newsletter, and Dave contributed a mountain of original art to the publication. He did illustrations for product reviews, caricatures for regular column headings, space filling spots and cartoons. One of his jokes was about the lizard camouflage being applied to the A-10 tank buster. Dave added a head, legs and wagging tail to the two-engined jet with the comment that the lizard camo was being taken too far! The cartoon was reprinted in a national modeling journal, which tickled Dave, of course, but not as much as seeing someone actually build a model of his silliness and entering it in a contest! 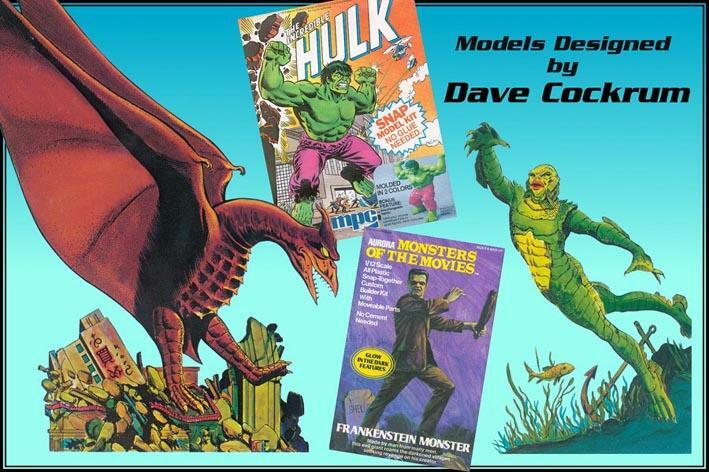 And speaking of modeling contest, Dave won quite a few awards with his models of space ships, monsters and comic book characters. Together, we always tried to promote more fantasy and science fiction modeling. We sponsored a few science fiction themed contests where Dave provided the first prize - an original piece of art of the winning model! That sure got some car, tank and plane modelers building something completely different. Yes, Dave and I shared many interest, but we didn't agree on everything. I wasn't one to keep pets, but Dave had a menagerie of exotic birds and reptiles. And I could never figure out why he didn't like the Buster Crabb Flash Gordon serials. Religion was another thing where we were at odds. Dave didn't have much to do with it, and I'm not sure what he believed in an afterlife. I remember a priest telling me a joke about how all the Catholics in Heaven were grouped together, separated from everyone else behind a high wall because they thought that they were the only ones up there. Well, I'd like to think that on the other side of that wall, off in a corner somewhere there's a piece of Heaven where fantasies become real. There, Dave is aboard the Nautilus (Disney version, of course) with Captain Nemo. He's in Sherwood Forest with Robin Hood, on Edgar Rice Burrough's vision of Mars with John Carter, on the RM-1 on man's first trip to the Moon. He's seeing dinosaurs first hand, battling the War of the Worlds, flying the XP6M-1 Seamaster and giving Zorro a few pointers. Surely it was the Creature from the Black Lagoon that gave Dave the crystal to unlock the Time Machine used to whisk him from realm to realm. He certainly hasn't had time to visit them all yet. The Blackhawks, Tinker Belle, Batman, Doc Savage, the Little Mermaid, Daffy Duck, Marvin the Martian and countless others will just have to wait their turn. I imagine that not far away from this place where Dave's dreams abide is a similar land, somewhat more special than the first. This is where the characters Dave created can be found. Dave's spending lots of time there, too, with Nightcrawler, Storm, the Starjammers, the Futurians, and even Dr. Fang and Long John Silverstein. But this place isn't just for Dave's benefit. It's for all the souls who relished those Cockrum creations. It's their place to live out their fantasies. And Dave is there seeing all the love and joy his creations bring to so many. And they'll keep coming to experience the Cockrum magic for eons to come. Proud to have been a friend. J'ai rencontré Dave Cockrum en 1972 alors que je vendais des kits à une convention de fans de comics à Manhattan et mon ami Mark Hanerfeld nous présenta. On s'est compris tout de suite. Il n'avait que 6 mois 1/2 de plus que moi et nous avions de nombreux intérêts communs : comics , maquettes, les films de SF des fifties , l'aviation militaire et en particulier les premiers jets , les dessins animés de la Warner, les films de Godzilla etc… c'est comme si j'avais rencontré le frère que je n'avais pas eu. Je travaillais à Aurora à l'époque, supervisant la conception des nouveaux kits et il ne fut pas difficile d'engager Dave pour la conception de nouveaux dinosaures et de monstres pour l'entreprise. Etant un fan de ces bêtes il avait déjà des tonnes de documentation. Etant un maquettiste il savait ce que ceux-ci attendaient. Etant un artiste il trouva des poses dynamiques comme on en avait jamais eu auparavant. Beaucoup de modèles de Dave contribuèrent à la réputation d'Aurora comme premier fabricant de kits de figurines. Parmi ceux-ci citons l'énorme T-rex au 1/12, le monstre de Frankenstein, Rodan et Ghidorah dans les monstres japonais et bien sur la Créature du Lagon Noir. 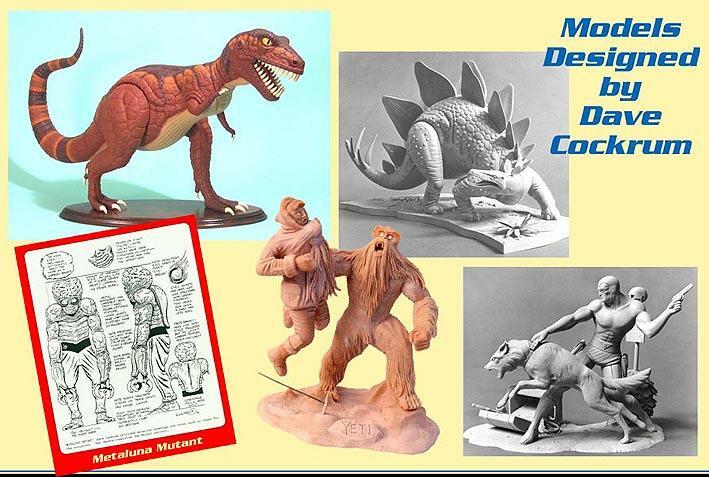 Malheureusement il y en eu beaucoup aussi qui restèrent sur la planche à dessin : Gort , le Mutant de Métaluna, le Phantom version comics, le Fantôme de l'Opéra, la Momie, King Kong, Godzilla, et un Stegosaure furent de ceux tués par un management désireux d'investir dans le jouet aux dépends des maquettes. Ah! Mais la magie de Cockrum ne pouvait être effacée et oubliée et bien des années après qu'Aurora ait disparu, des fans d'Aurora et de Dave produisirent certains de ces designs en figurines résine de tirage limité. Que Dave soit devenu l'artisan majeur du revival des X-men est bien connu et je n'ai pas grand chose à y ajouter si ce n'est que Dave m'a permis d'apporter ma touche à histoire des X-men. Après avoir quitté Aurora je suis arrivé chez Marvel comme coordinateur de la mise en couleurs. Dave n'était pas satisfait des couleurs données aux X-men et me demanda de mettre en couleur l'album (il était sur que je réussirais au moins les avions). Je l'ai fait et au fil des années j'ai établi la mise en couleur de plusieurs personnages. Bien que nous travaillions ensemble à Marvel, Dave et moi étions encore plus liés par les maquettes. Nous étions tous les deux membres du Brooklyn Plastic Modelers' Society (BPMS) de même que la femme de Dave, Paty ! Dave et Paty venaient tous les mois aux réunions au prix de plusieurs heures de conduite. Dave avait généralement un nouveau modèle à exposer tandis que j'étais le rédacteur du bulletin de liaison et Dave contribua des tonnes de dessins originaux pour cette publication (analyses, caricatures, têtes de colonnes…) Une de ses blagues favorites concernait le « lizard camouflage » appliqué à l'avion anti-char A-10. Dave ajouta une tête , une queue et des pattes à l'avion avec le commentaire que c'était pousser le camouflage un peu loin! Le dessin fut repris dans une revue de maquettisme nationale ce qui l'a bien sur excité ...mais moins que de voir quelqu'un traduire son dessin en 3D et le présenter à un concours. Parlant de concours, Dave en gagna quelques-uns avec ses astronefs , ses monstres et ses super-héros. Ensemble nous avons toujours essayé de promouvoir le maquettisme SF et fantastique. Nous avons sponsorisé des concours sur ce thème , le prix étant toujours un dessin original de Dave. C'est sur que çà a poussé des maquettistes traditionnels à se lancer dans une nouvelle voie ! Oui Dave et moi avions de nombreux intérêts communs mais nous n'étions pas d'accord sur tout : je n'ai jamais été quelqu'un « à animaux » alors que Dave avait une vraie ménagerie d'oiseaux exotiques et de reptiles...et je n'ai jamais compris qu'il n'aime pas les serials de Flash Gordon! Religion est aussi un point sur lequel nous nous séparions. Dave n'était pas trop intéressé par çà et je ne sais pas trop à quoi il croyait. Je me rappelle d'un prêtre m'ayant raconté une blague selon laquelle les catholiques étaient tous rassemblés ensemble au Paradis, séparés des autres par un grand mur car ils croyaient qu'ils étaient les seuls ici. J'aimerais croire que de l'autre côté du mur il y a un coin du Paradis où la fantaisie devient réelle et que Dave y réside à bord du Nautilus (version Disney bien sur).Qu'il est avec Robin des bois dans la forêt de Sherwood et sur la Mars d'Edgar Rice Burrough avec John Carter. Il est sur le RM-1 pour le premier vool vers la Lune. Il observe les dinosaures en direct, il vole sur le XP6M-1 Seamaster et échange quelques coups d'épée avec Zorro. Ce fut sûrement la Créature qui donna à Dave le cristal pour actionner sa machine temporelle qui le transporte d'univers en univers. Et il lui en reste bien d'autres à visiter : les Blackhawks, la fée Clochette, Batman , Doc Savage, la Petite Sirène, Daffy Duck, Marvin the Martian et bien d'autres devront attendre leur tour !